What are the top landmarks in Bergen? Traditional wooden houses once occupied by merchants line alleyways by the waterfront, where you’ll find hand-made souvenirs, seafood restaurants and museums. Go hiking and picnicking in summer and sledding in winter on this picturesque mountain within easy reach of the city center. Ride the cable car from the center of Bergen to the top of Mount Fløyen for incredible views across the fjords and access to picturesque hiking trails. 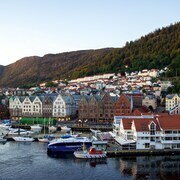 Enjoy an outing to Bryggen Waterfront during your stay in Bergen. Visit the shops and top-notch restaurants in this culturally rich area. Make the journey up Bergen’s highest mountain to hike, dine and enjoy incredible panoramas across the mountains, fjords and sea. Eat local specialties such as fresh caviar, pickled herring and fish soup at this lively outdoor market that dates back to the 12th century. 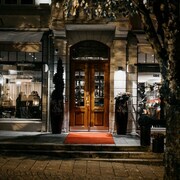 An historic neighbourhood, Bergen City Centre offers a variety of options for seafood restaurants. The neighbourhood’s charm comes through in its rich culture. For a taste of local culture, you can visit the museums and art scene. Bergenhus is a welcoming neighbourhood. Sentrum is a neighbourhood that welcomes all visitors. Årstad is a welcoming neighbourhood. Fyllingsdalen is a welcoming neighbourhood. Sandviken is a neighbourhood that welcomes all visitors. 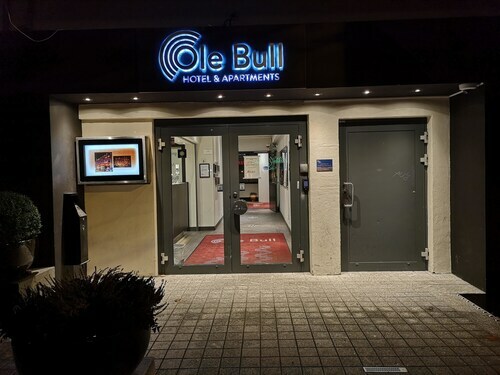 Super location in the heart of Bergen the staff are friendly, speak excellent English and the apartments are well equipped including fridge, cooking and dishwasher. 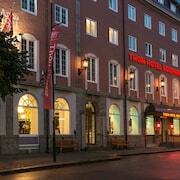 Central in Bergen with Unesco heritage area, fjord sightseeing, trains to Oslo and Fl�m, restaurants. 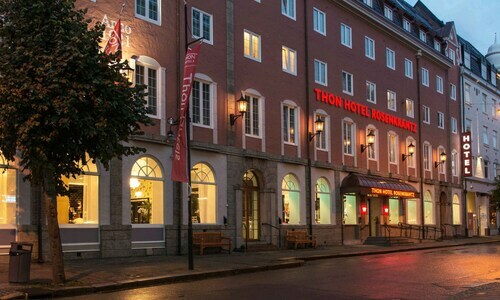 The hotel was located right next to the old, historical part of Bergen and ideally placed for many attractions in the city. Scandic Ornen is a beautiful, cosy and chic hotel, perfectly located in Bergen for any central work or pleasure activities. We stayed for 4 nights whilst visting our daughter in Bergen. Super friendly staff. Layout of the family rooms really worked. Excellent breakfast both in terms of quality and the vast choices available. Super close to the town centre, bus station and train station. Highly recommended by my family and I. The young man at reception was very friendly and helpful. The location was excellent. The cleanliness was not great and the room was quite tired, the furniture was damaged and scuffed. Surrounded by seven hills and seven fjords, the UNESCO World Heritage city of Bergen lies on Norway’s southwest coast and is the second largest in the country. Its history stretches back more than 900 years, to the Viking Age, and as a member of the Hanseatic League, it became a prosperous port town through its vibrant trading relationships with other European cities. Today, Bergen is still a major port but offers more of a laid back small-town vibe due in part to its sizeable student population. With dozens of hotels and one of the most spectacular settings of any Scandinavian city, it’s perfect for both a short break in its own right or as a base for a wider exploration of the western fjords. It also boasts a lively cultural life with numerous museums, galleries, Medieval buildings and markets. Visit Bergen in the late spring or summertime and you may never witness the sun go down. At this time of year, the city parties around the clock and an exuberant energy takes hold. But it’s equally atmospheric in autumn and wintertime too, when the population simply moves indoors to the candle-lit cafes, coffee shops and bars, or heads up to the mountains for a spot of sledging or cross-country skiing. The Fløibanen funicular to the top of Mount Fløyen – one of Bergen’s most popular attractions – is open all year round, as is the cable car to the top of Mount Ulriken. With mountain-top restaurants and panoramic views, both destinations are essential Bergen experiences. What Are Bergen’s Best Highlights? Bryggen – the old Hanseatic wharf lined with colourful wooden buildings – is today the most famous symbol of the city. The Medieval wharf was built after the great fire of 1702, and the area is home to the fish market and the Bergenhus Fortress, along with many boutiques, craft shops, restaurants and cafes. Close at hand is St Mary’s Church, or Mariakirken, the oldest existing building in the city. Dating from the early-12th Century, its interior features a pulpit unlike any other in Norway, as well as a number of 15th-century frescoes. 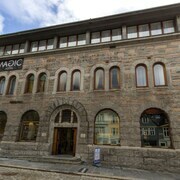 Also nearby are the Theta Museum – a single room used by the Resistance Movement during Norway’s 1940–1945 occupation – along with the Bryggens Museum, the 1560s-built Rosenkrantz Tower, and Bergen Cathedral, which offers free organ recitals in summer. While you’re in Bergen, take the opportunity to venture further afield. Western Norway is a landscape of rushing waterfalls and creaking glaciers, of snowcapped mountains and seemingly bottomless fjords, and Bergen is its most obvious gateway. Some of the most popular and easily accessible fjords to visit include Hardangerfjord – the fourth longest in the world – which lies to the south of the city; the World Heritage-listed Nærøyfjord, which is the one of the narrowest in Europe and Norway’s longest fjord, Sognefjord, to the north. You can also take a ride on the famous Bergen and Flåm Line railways, often touted as the most beautiful train journeys in the world. Still in need of more inspiration? 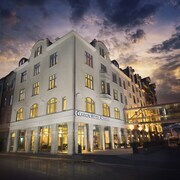 Check out our hotels in Reykjavik. Explore Bergen with Expedia's Travel Guides to find the best flights, cars, holiday packages and more!